PRESTAR PLASTIC TROLLEY 895X595MM 300KG PF-302 FIXED HANDLE is rated 4.9 out of 5 by 7. Rated 5 out of 5 by briankee from Great, Robust and Rather Silent Trolley Bought this trolley and it arrived couple weeks back in good condition. I've been using it to shift stores around the the office and it's robust and rather silent to use! Rated 5 out of 5 by trolley buyer from Prestar trolley Great trolley. the trolley is stable and big enough to put my items. smooth rolling without any noise. recommend to get. Rated 4 out of 5 by kywl from Efficient Services! I ordered a trolley online and it was processed and delivered very quickly. Rated 5 out of 5 by Mimixue from Awesome trolley with striking Colour! Used to push goods with 150kg limit trolley.. Poor trolley "cries" due to overloading.. 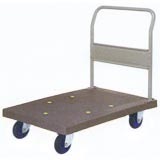 This new trolley takes on weight double than the old trolley and is smooth and sturdy! Now with the new yellow Colour, can differentiate our trolley from the other stores! Thumbs UP!